During my life experiences I have seen many who for untold reasons have chosen not to yoke themselves to a particular church or denomination. This has caused heartaches and confusion for many as they started trying to plan a wedding, baptism, child naming, or for a funeral, committal or memorial service. Not knowing which way to turn, where to go? During my tenure as a counselor and spiritual director I have seen the effects of those heartaches and felt a strong need to help fill that void, my calling. After extensive studies I was ordained in 1998 as an Independent Minister with the American Catholic Church. 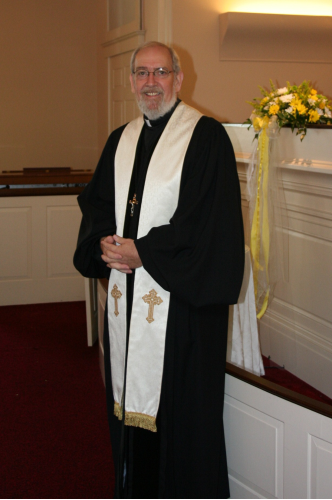 Continuing to teach and counsel in the area of spirituality and life's issues I broadened my outreach Ministry as an Interfaith Christian Minister and was incardinated as a Catholic Priest in Apostolic Succession within The Reformed Catholic Church International. Being molded in the traditional spirit of Benedictine hospitality which is to offer without question the Word and Sacraments to all who request them I am now fulfilling that calling. Serving all who ask. As my general purpose is to let the world be a more compassionate place inviting peace and joy. I am here to serve you. Congratulations! on your engagement and upcoming marriage. You have likely come searching for someone to officiate at your ceremony which legally, publicly and more importantly, emotionally, represents your commitment to your beloved. Our ministry is non-denominational serving all faiths, though Christian in nature we believe that all faiths have enlightened paths to the Godhead our outlook is that of a Spiritual nature rather than a religious one. We are here to offer without question the Word and Sacraments to everyone who requests them, we are here to serve.Currently Rev. Scarlett, Ph.D. is a Licensed Alcohol Drug Counselor and is serving as Chaplain at Taunton State Hospital, and first response for ﻿FEMA﻿ / MEMA / TEMA, and a Spiritual Director. Rev. Michael is also affiliated with Ocean State Weddings Christian Non-Denominational Wedding Officiants. Finding someone other than a Justice of the Peace to officiate your ceremony can be a difficult task. You might be new to the area, don’t have a regular church or might have issues with your own church. Many ministers will not perform services out side their own church they some how feel that it is wrong or church regulations for example divorce might not allow them to. As members of outreach ministries, we can provide warm and relaxing, spirit wedding ceremony services anywhere in Massachusetts, Rhode Island, or Connecticut from simple and traditional, to not so traditional, at a location of your choice; beaches, lighthouses, churches, banquet facilities, a park or garden, or in your home sunrise, sunset, and anywhere in between.